It’s officially sweater weather here in Baltimore, and I couldn’t be more excited. There’s a crisp nip in the air every morning and evening that smells fresh and slightly of pine. The birds are chirping a cheerful song and the sky is a crystal clear blue dotted with big, puffy clouds that look like wisps of cotton. It’s picturesque, really. I’ve been baking up a storm with my windows open–teasing my poor neighbors, I’m sure. Most of the baked goods I’m pumping out are made with, you guessed it, pumpkin! I know I’ve mentioned it several times, but I’m gonna say it again for good measure–I love pumpkin! Its beautiful orange hue, the warm spices, the smell…I can’t get enough of it during the cooler months. So, I do what any pumpkin-loving foodie would do. I hoard pumpkin. Hi, I’m Jennie, and I’m a pumpkin hoarder. Whew, glad I got that off of my chest. 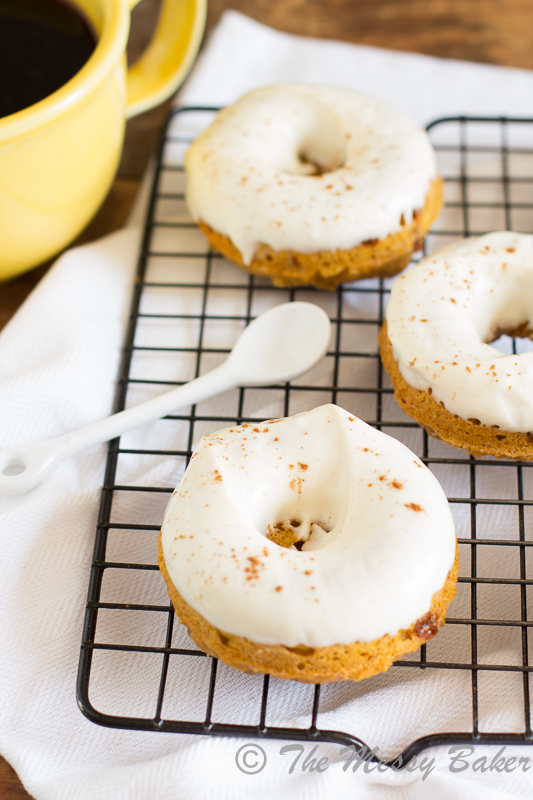 Now, let’s bake us some pumpkin donuts, shall we? This week’s #SundaySupper is all about fall recipes. Are you excited? Let me tell you what’s even more exciting…skinny donuts! Did you just do a double take? 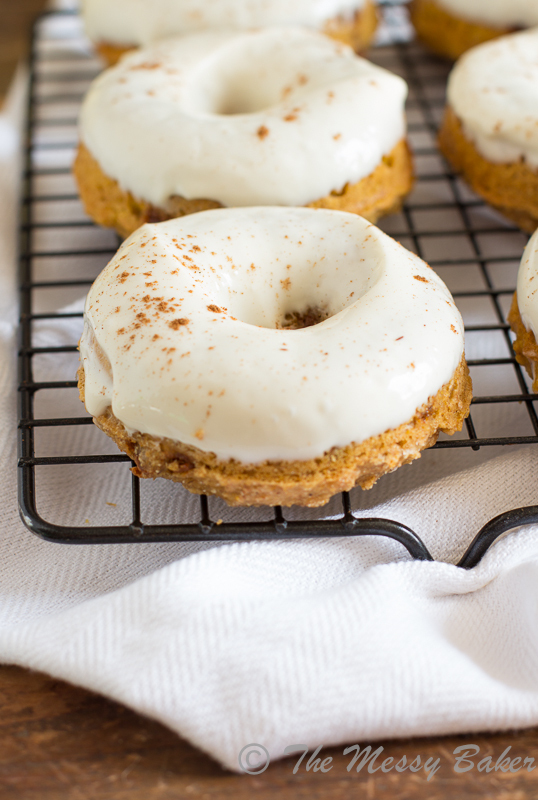 The words skinny and donut aren’t usually found in the same sentence, but today is your lucky day because I made skinny pumpkin cinnamon chip donuts with a maple cream cheese glaze. Here’s the thing. I’m a donut addict. One just isn’t enough. I take donut consumption to an entirely new level. Like, 3 donuts in one sitting and I’m reaching for more. I blame it on the donut, with its shiny glaze and colorful sprinkles. Can you blame a gal? How do I fix a donut addiction? No, not by giving up donuts cold turkey. That would just be cruel. I make them skinny, of course. Three skinny donuts is equal to one regular donut–problem solved! I made these donuts using a combination of white whole wheat flour, pumpkin, a small amount of brown sugar, coconut oil, homemade pumpkin pie spice, only one egg, and a handful of cinnamon chips. What? No butter? You won’t even miss it. I traded the butter for healthy coconut oil. Don’t worry, you can’t even tell there’s coconut oil in them. They taste purely of pumpkin. Oh boy, are these ever so moist. They melt in your mouth. I almost forgot to tell you about the best part. Shame on me! These sweet little circles get dunked in a maple cream cheese glaze. I know, right! The glaze is super simple to whip up. I used low-fat cream cheese, maple syrup, and milk. That’s it. These are Squirrel approved. He poured himself a big ol’ glass of milk and got to chowing down on a donut. I look over, and he just nods. Donut seal of approval. I had this impression that donuts were time consuming… Boy, was I wrong. This recipe only took me 10 minutes to whip up and only 12 minutes to bake. Can somebody say donut party every weekend? 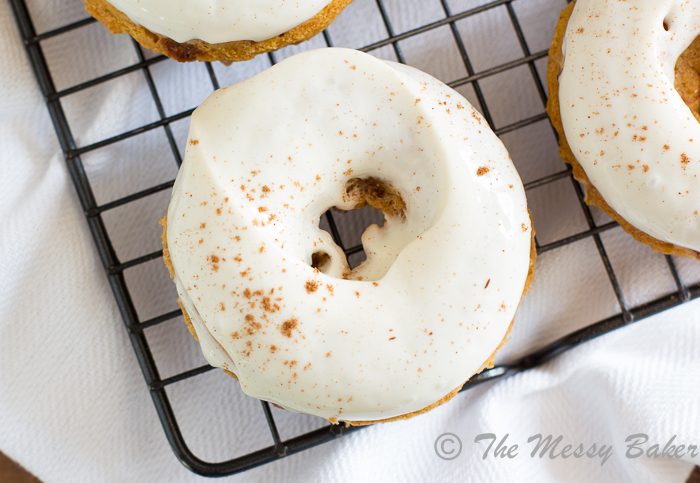 Fluffy baked pumpkin donuts studded with sweet cinnamon chips and topped with a cream cheese glaze. Preheat oven to 350 degrees F. Spray a 6-cup donut pan with baking spray. In a small bowl, whisk together the dry ingredients; set aside. In a large bowl, whisk together pumpkin puree, brown sugar, and coconut oil until smooth. Add the egg and vanilla extract, and whisk until smooth. Slowly whisk in the buttermilk until smooth. Fold the dry ingredients into the pumpkin mixture until just combined. Fold in the cinnamon chips. Carefully spoon the mixture into your prepared donut pan. Bake for 12-13 minutes. Allow the donuts to cool in the pan for 5 minutes before transferring to a wire rack to cool completely. Dip the donuts into the glaze. Best eaten the same day. Add the cream cheese to a large bowl. Using a hand mixer, cream until smooth. Add the maple syrup, vanilla, and milk; whisk until smooth. If the mixture is too thick, add a little more milk. I’m Dorothy and I’m a pumpkin lover, too. There, I admitted it. Welcome, Dorothy. Now, let’s go make some more pumpkin treats. We are donut addicts over here! 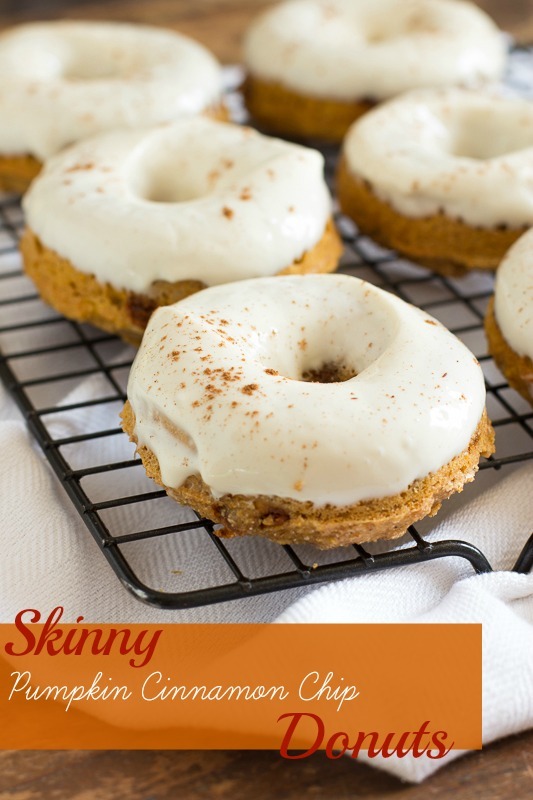 Would love some skinny pumpkin donuts this morning. The glaze sounds divine! Thanks, Marjory. I’m happy to have donut-loving company. Thanks, Stacy! Fall is my fav, too. Can I come to the donut party? Pleeeeeaaaaassse? Only if I can come to your waffle party. Okay, so I’m kinda hating on fall and want summer to come back, but these look and sound crazy good! Healthy, yummy, and easy to make. Plus cinnamon chips are my fave! Summer lovers are welcome here, too :) Cinnamon chips are the best chips on the face of the Earth. Thanks, Laura! Hey Jennie! I missed your treats! I did do a double take at the word skinny lol! I don’t own a donut pan, I like you thought making them was time consuming, something I surly don’t have these days, but after reading this, I’m giving them a shot, holy goodness! Thanks, Tammi! I missed my #SundaySupper group. I ordered my donut pan on Amazon. These are so simple to whip up. “Hi, I’m Jennie, and I’m a pumpkin hoarder”, hahaha welcome to the club. :) I love these! Must make, SOON. Welcome, Nichole. Pumpkin is my food drug. Thanks for visiting. Cinnamon chips, pumpkin, and take less than 30 minutes? These are a dangerous recipe… at least they’re skinny! Dangerous, indeed. Guilt free is always welcome in my house because I have no will power. Looks like it’s time for me to get a donut pan! I always thought it was time consuming too, but this has sold it for me! Love this donuts Jennie! I’m getting into my pumpkin loving time too! I’ve got a stash in the fridge now for whenever the mood strikes! My stash is piled high in my pantry. Thanks! Oh my gawd, I’ll totally trade you for one of those. That’s just… that’s just… sinful. And amazing. And wow…. And they are skinny! Mine… not so much. LOL Now I really want one! Ha, ha. Thanks, Nicole. You have a deal, my friend. Beautiful, Jennie! 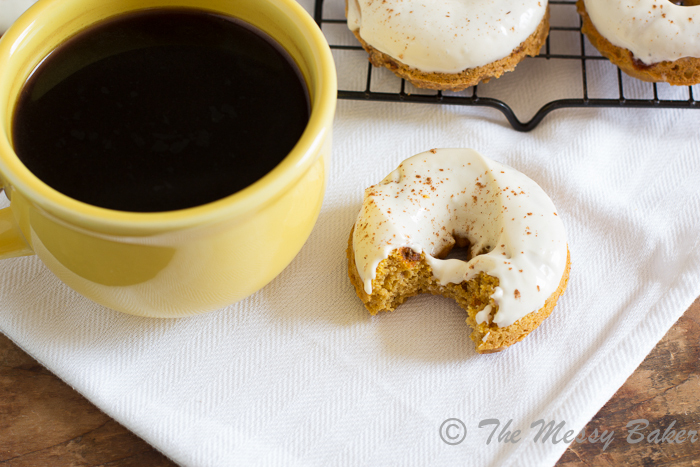 These pumpkin donuts are perfect and since the Fall is here – they have to happen soon! Pinning! I am all for a donut party :) These are beautiful..so perfect for fall! Pinning too..
I’ll take a dozen with a vat of coffee please! These look awesome! I like how you roll, Amy. These donuts look just stuffed with awesome! I love any excuse to use my donut pan, thanks for the awesome recipe. You had me at maple cream cheese frosting, wow. So good! Loving today’s Sunday supper! I just bought a large amount of pumpkin and plan on making a lot of things. I better get hopping, and this recipe is just amazing! Brilliant Jennie to make them lower in fat! Thanks, Paula. The more pumpkin, the better. Oh my my my. These donuts looks SO good and pretty too. I just got a donut pan too, so I’m excited to try these. Alida, prepare yourself for a donut addiction. Thanks! Gotta love eating more. Thanks, Carla. These look amazing, and with a couple mods I can even make them! Oh my gosh your donuts look out of this world! I love the frosting! I would LOVE one of these donuts right now!! I’m not a doughnut fan, but your’s look incredible. It’s so great that you baked instead of deep fried! Thanks for sharing! Oh my gosh, Jennie, these might make me get a donut pan!! You won’t regret the purchase, Brianne. Mmmm that glaze sounds deliciousssss! 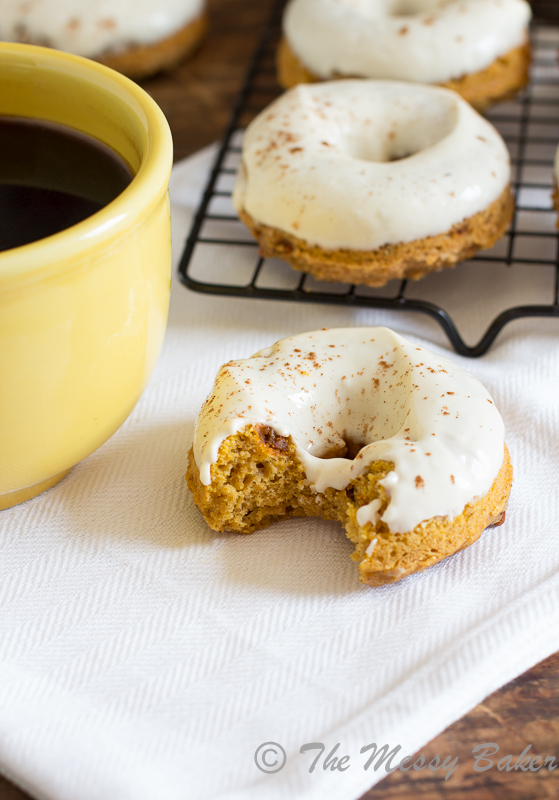 I make lots of baked, skinnier pumpkin doughnuts but I’m totally stealing that glaze idea. Oh, and my name is Anita and I’m a pumpkin hoarder. 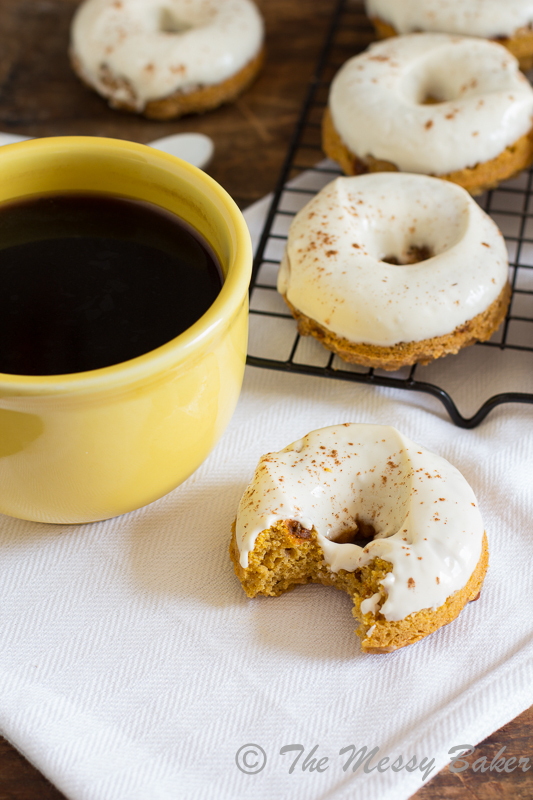 I just made some pumpkin mini donuts for our Sunday morning breakfast, and I had the same revelation — I had NO IDEA they were so quick and easy to make. No idea, whatsoever! It’s probably good for my waistline that I didn’t realize this earlier (but they’re baked, and they have pumpkin, so they’re healthy, right?). But in all seriousness, your recipe looks fantastic! Especially with the cream cheese maple glaze! I love that they only took a few minutes to whip up, but now I’m going to be power eating homemade donuts. Thanks, Jamie! Uru, I’m pretty sure that’s possible. Thanks! Jennie, these look amazing, especially loving the glaze replacing the usual sugary ones!! I haven’t had a doughnut in ages now I’m craving for some. This recipe is bonkers! I am drooling over that maple cream cheese frosting! I also eat three doughnuts in one sitting, no shame. My hips thank you for making these skinny! You are welcome, Stefanie’s hips :) My hips are so thanking me. They were getting wider by the day. Maple cream cheese glaze! Sign me up! You’re on the list, Sarah! Love baked donuts! oh and that glaze! They are just beautiful! I’m crying because I don’t own a donut pan and I want one SO.BADLY so that I can make your glorious donuts. Jennie, I’m swooning over these photos. The donuts look ridiculously moist ‘n yummy, especially with that luscious, snowy white cream cheese glaze. Love.these. Um… these doughnuts make me happy in a major way!!! And that’s that. Thanks, Ashley! It’s because they’re skinny and full of pumpkin goodness. WOW! I hate store bought donuts but I love to make my own. These ones are next on my list, especially since we have so much pumpkin! I couldn’t agree more. Thanks! These look SO good and I love that they’re skinny, too. YUM! Best. donuts. ever. I could seriously have this all year long! Ooh yum ! Especially love the frosting! Great pics too. Isn’t it amazing how the air smells so different in the fall? Even here in a big city, on cool crisp days, the air has a different scent (and I don’t mean smog lol) … I need to get myself a donut pan as I *must* make these donuts! I’m dying for donuts and that these are actually “good” for you – well I’m sold! Thanks, Amanda. They’re definitely healthier than a regular donut, for sure. Hi there! These donuts look and sound amazing–I really want to try them (I even recently bought a donut pan)! Since I haven’t had a donut in over a year due to new eating habits, and I couldn’t find the nutrition content for these donuts, I used the myfitnesspal.com recipe calorie counter to do the math for myself. I can’t speak to the accuracy of that calculator, but it put the total calories for this recipe at 2,212. Divide that by 6 (6 portions) and it came out to 369 calories per donut. I know there can be some variances (i.e. egg size or brand of cinnamon chips), so for reference I used the following: light brown sugar, large size egg, unrefined coconut oil, Hershey’s brand cinnamon chips. I am not trying to prove you wrong or be rude. It’s just that as stated above, this donut really wouldn’t be any less in caloric content than if I went to a regular donut shop. Did I miss something? Can you clarify? Because I REALLY want to make (and eat) these!! !